Cara Burrows leaves her husband and two children and flies to an expensive spa resort in Arizona. Written in the first person the reader is quickly aware of the panic Cara is experiencing as she attempts to justify to herself what she has done, spending a huge chunk of the family savings on a holiday, but she keeps coming back to the fact that she needs the time away from, as she puts it, ‘an unbearable situation’. All she wants to do now is get to her room, cry, eat, have a bath and sleep. Tired and emotional she manages to find her hire car, get to the spa, and register. Signing with relief she inserts her key card the light goes green and she is in…. but there are two people in her room! A distraught receptionist apologies profusely for accidently sending her to the wrong room and she finds herself upgraded to a clearly expensive suite. Refreshed the following day she sets out to familiarise herself with the spa’s facilities. Despite her decision to keep her distance from people and use the time to sort out her feelings, overhearing conversations she becomes embroiled in a bizarre situation. Did she see Melody? 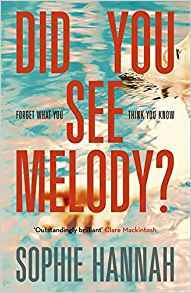 The back story is told from two sources, firstly the recollection of a young girl who Cara learns was murdered by her parents, now serving a prison sentence. And Internet reports of a TV Show ‘Justice with Bonnie’ in which the vitriolic Bonnie interviews the people surrounding the death of Melody Chapa. With well-fleshed out characters, the twists and turns of the story keep the reader avidly turning pages. Almost a character in itself is the Swallowtail Spa – do places like that really exist? Although, when the cleverly constructed plot is revealed it answers the many questions raised during the Internet coverage read by Cara, it is the mind-blowing ending that turns the whole book on its head. A fascinating read with an equally fascinating ending. Sophie Hannah is an internationally bestselling crime fiction writer. Her crime novels have been translated into 34 languages and published in 51 countries. Her psychological thriller The Carrier won the Specsavers National Book Award for Crime Thriller of the Year in 2013. 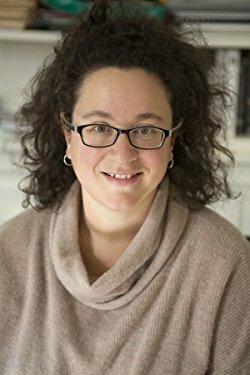 In 2014 and 2016, Sophie published The Monogram Murders and Closed Casket, the first new Hercule Poirot mysteries since Agatha Christie's death, both of which were national and international bestsellers. Sophie’s novels The Point of Rescue and The Other Half Lives have been adapted for television as Case Sensitive, starring Olivia Williams and Darren Boyd. Sophie is also a bestselling poet who has been shortlisted for the TS Eliot award. Her poetry is studied at GCSE and A-level throughout the UK. Sophie is an Honorary Fellow of Lucy Cavendish College, Cambridge. She lives in Cambridge with her husband, two children and dog.